I secretly love obnoxious glitter. There’s something about the act of plonking down some fun shaped glitter on top of a mani that feels really special. Are 65% of these harts going to fall off in the next 30 minutes while I go about the process of getting ready for bed? Oh absolutely. But maybe that’s why it feels so indulgent. These pokey hearts are for me (and you, since I photographed them) and I don’t give a damn if they last until tomorrow. Except for star glitter that gets caught on my hair. That’s a special case. Today I have a heart-filled Valentine’s day look to show off. I started off with a base of Doctor Lacquer “Betelgeuse,” which should have been a tricolor pink thermal. The bottle I got recently is stuck in the medium tone, which suits this manicure just fine. There’s a review of “Betelgeuse” headed for the blog one of these days, when I finish editing photos. Over “Betelgeuse” I added a quick stamped accent using Bundle Monster BM-XL09 and their white stamping polish. Then I top coated with Love, Angeling “Topped With Love” and slapped some assorted white and iridescent pink heart glitter on top and I was good to go! What do you think? What’s your stance on bigger shaped glitter? What’s the coolest and/or least traditional glitter you’ve seen? Hah this is so whimsical and lovely! I’m not generally one for larger glitter like this but it is so cute on you! This is so cute! I usually avoid the big glitter, but that’s way too cute to avoid! Love it! 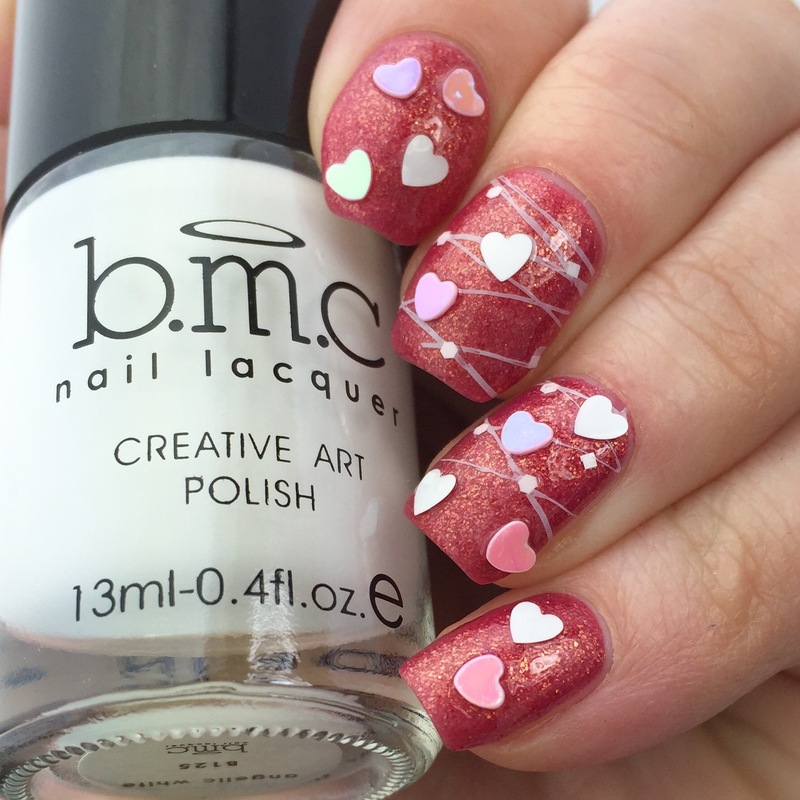 I love hearts on ANYTHING but on your nails especially PRETTY!!! And that base coat was/is perfect!! I adore big glitters like this too! Such an adorable mani. These are super cute. I don’t do a lot of “chunky” or 3D things on my nails (unless I’m just photographing the manicure for the blog and removing it), just because it falls off so quickly like you said! But…sometimes they are too cute to pass up! 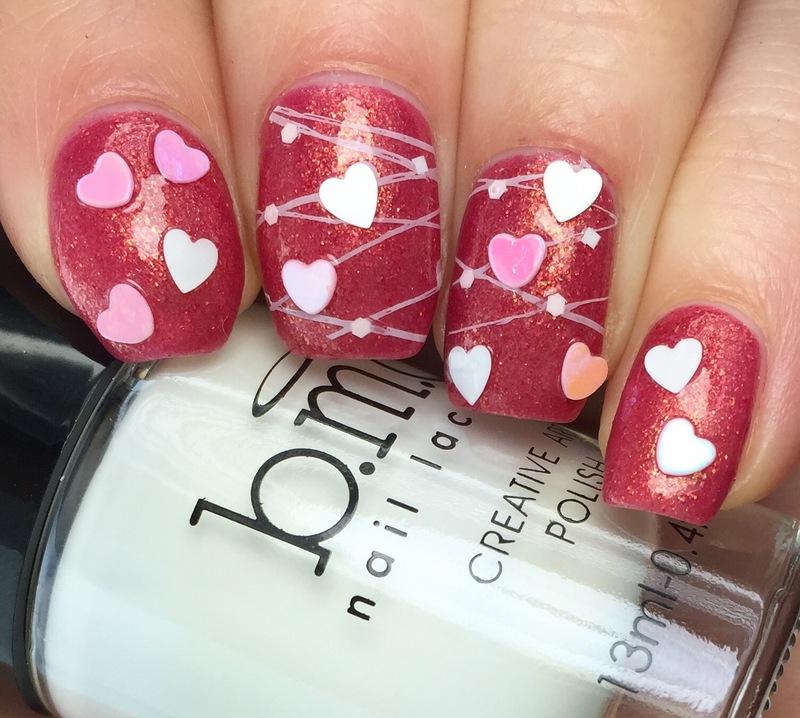 I just love the added heart glitter! Pure genius!! I’m a picker and these adorable hearts would be gone quickly. They remind me of the candy hearts with words on them. Haha! This is so much fun! I’ve got a collection of random glitters to add to my nails- music noted, sea turtles, dolphins…..they’re always fun to add and see how long they’ll stay put! I LOVE LOVE LOVE THIS!! 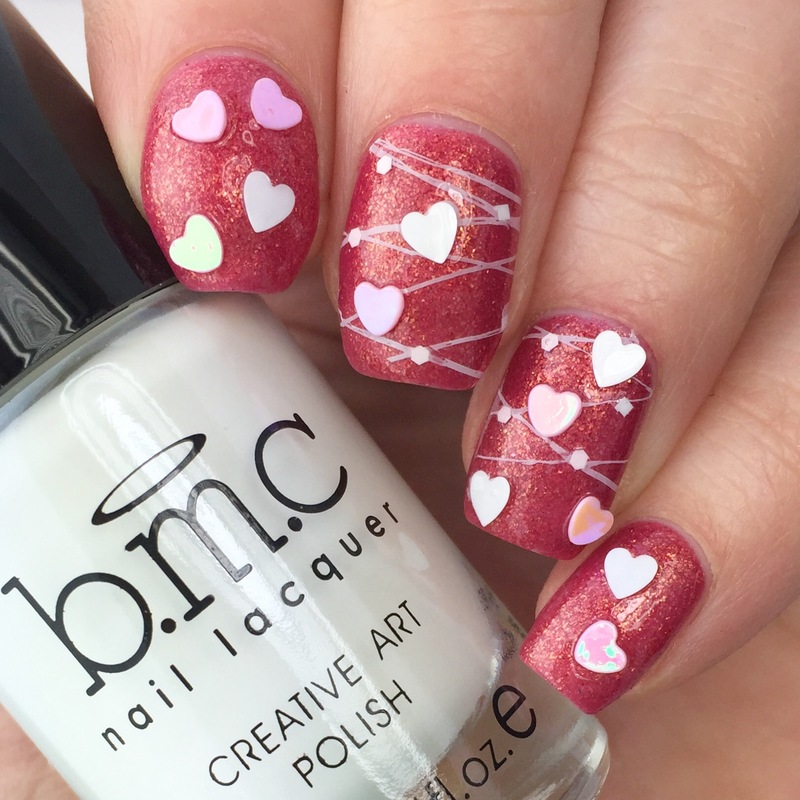 It’s like you stuck your hands in a bag of candy and you got cotton candy and hearts stuck to your nails. Adorable! I adore those hearts – doesn’t matter if they fall off, it’s worth it just to see the prettiness just once. I wore star glitter for a date (he didn’t even glance near my nails haha). It was worth it though the stars fell off during soup and rolls. 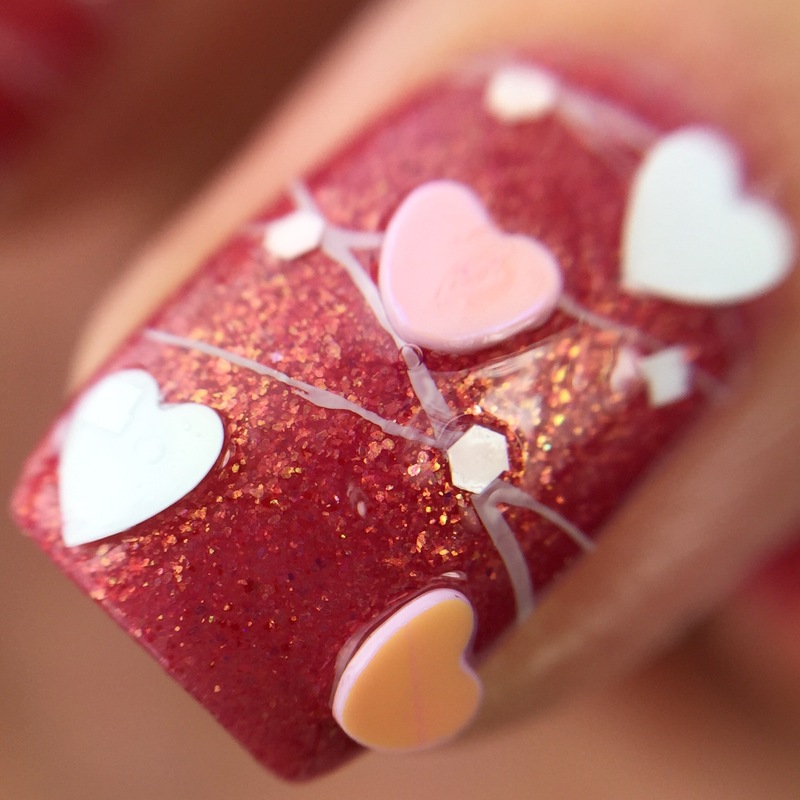 Oh my goodness, this nail design is SO cute! I just love it!!! You aren’t your PHD in Nail Polish with this one, lol! Can’t get over how beautiful and adorable it is! Perfect placement of ‘obnoxious’ glitter!!!! Seriously, I too love this type of glitter!